Back in the day there was this great open source lib called XLabs that targeted Xamarin Forms. It had a lot of nifty controls and custom renderers to fix several pain points while developing for Xamarin Forms. But Xamarin Forms evolved and XLabs was not maintained as regular anymore and it now seems to be stranded at a dead end. BUT, even though the code targets an older version of Xamarin forms, it doesn’t mean that there is no longer any value in it. I’ll give you an example: the RepeaterView. This is a nice control that helps you ‘repeat’ data elements without actually using a ListView, this can be handy if you just want to show an iteration without any possible user interaction, or if you want to be able to show all items in the collection and control your own scroll region. Whatever the reason, XLabs had us covered and we can still use it today! So let me show you an example of how I needed to use it on a recent design issue I had. In short, this would not be doable straight out of the box wit general ListView grouping. You could just put 2 ListViews on the page, but that would not help the UI. Because we want the user to be able to scroll through 1 list with all the data in it. There are possibly several ways of fixing this, but I went for the use of RepeaterView in combination with a grouped ListView. 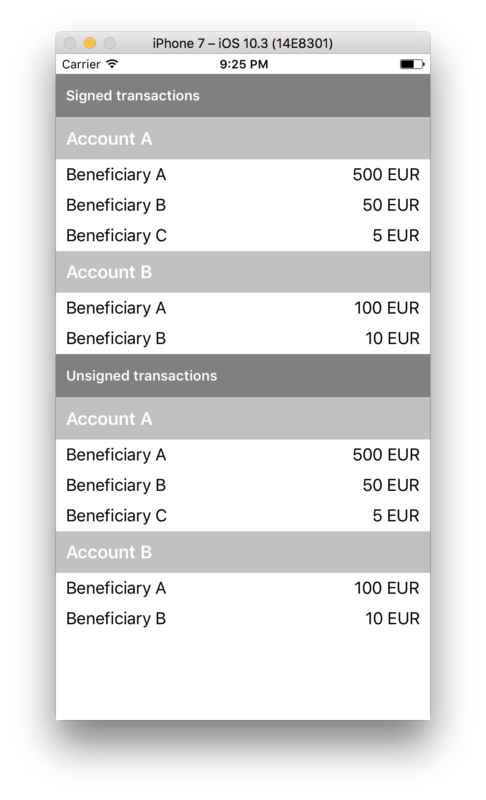 Transaction and Account class, are the real data holders and we added GroupedTransaction and GroupedAccount to be able to actually group the data and use it for the grouped ListView. Next up the RepeaterView, I modified the XLabs version so it would work in our newer Xamarin Forms environment, but do note that my version is also stripped down to the bare minimum that I needed for this UI. The RepeaterView takes a generic T that is being used for the items enumerator. We need to keep that in mind when we write our XAML, because this has to be supplied there. Other than that this control is very basic, you need to give it an ItemsSource and an ItemTemplate and it will use those to build the UI. There is also an extra option to add a HeaderTemplate, if you want some text on top. But this isn’t used in this demo. We are using a grouped ListView for creating the first and second data level, in our case the signed and unsigned transactions are mapped with the ListView GroupHeader, the account information is used in the ItemTemplate. But also inside of the ItemTemplate we are using our RepeaterView to show the transactions. This will give use 3 levels of information that are all repeatable. Note the use of x:TypeArguments=”models:Transaction” on the RepeaterView, that’s the way to pass data to your model. This will be used for the type T of the RepeaterView. Hi! how can add command into controls:RepeaterView ? Thanks! Nice control, but I can’t get it to update when the binding changes. ItemsChanged is only called when the page is created.